This article presents a review of a supplement known as Alz Vitamins. This product consists of non-pharmaceutical vitamins and the manufacturer claims that it has significant results towards dementia and Alzheimer’s disease symptoms. It increases brain blood flow, reduces plaque accumulation, and alleviates the physical symptoms associated with Alzheimer’s disease. Vitamin C- helps to protect the brain and clear free radicals. Vitamin E -works like vitamin C above. Vitamin B3- lowers “tau” protein levels. Vitamin B12- plays a crucial role in stimulating nerve cells. Vitamin D- increases brain performance. Vitamin B6- known for slowing the shrinking rate of the brain, as well as atrophy. Vitamin B1- helps to relief depression, irritability, and weariness. Vitamin B9- helps to reduce memory problems. 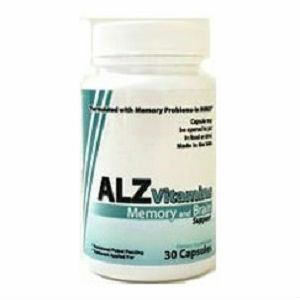 One pack of Alz Vitamins contains 30 capsules. The manufacturer asserts that there is no need for a prescription for consumers to take this product. However, it is suggested that users should take one capsule per day or according to the directions given by a medical professional. Users may open capsules and mix them with drinks or food. It is risky to exceed the recommended dose. Pregnant and nursing women are advised to consult a physician before using this product. The same applies to people under eighteen years of age and persons with known medical conditions. This product cost $24.95, which is a fair price for a product that mainly consists of vitamins. We did not find any information about discounts. No information was found about a money-back guarantee for the product. Additionally, there is no evidence of customer reviews. As a result, potential users may worry about the efficacy of the product and if it doesn’t work, they’ll be concerned they won’t be able to receive a refund. This product is appropriate for people suffering from dementia and Alzheimer’s disease. The manufacturer is specific about what health conditions the product can aid in treati ng. One of the noticeable facts about this product is its combination of the known vitamins. The major ingredients are approved vitamins, which increase the credibility of the product and consequently, the confidence. However, this product lacks a money-back guarantee and customer reviews meaning that buyers might not be confident with the product. These deficiencies may be a source of quality concerns because they affect the trust of potential new users. Moreover, the manufacturer has not provided any information about the possible side effects of the product meaning that new consumers might be worried. It is also evident that this product may not be appropriate for vegetarians because some ingredients such as gelatin contain trace animal products. This fact is compounded by the manufacturers caution that the facility also processes animal products including milk and fish meat, which may cause allergic reactions to some people. It seems like this product lacks a lot of critical information to back up the claims of the manufacturer. Therefore, it is highly recommended that users should consult medical professionals before using this product. Henry Costa	reviewed Alz Vitamins	on June 14th	 and gave it a rating of 2.5.